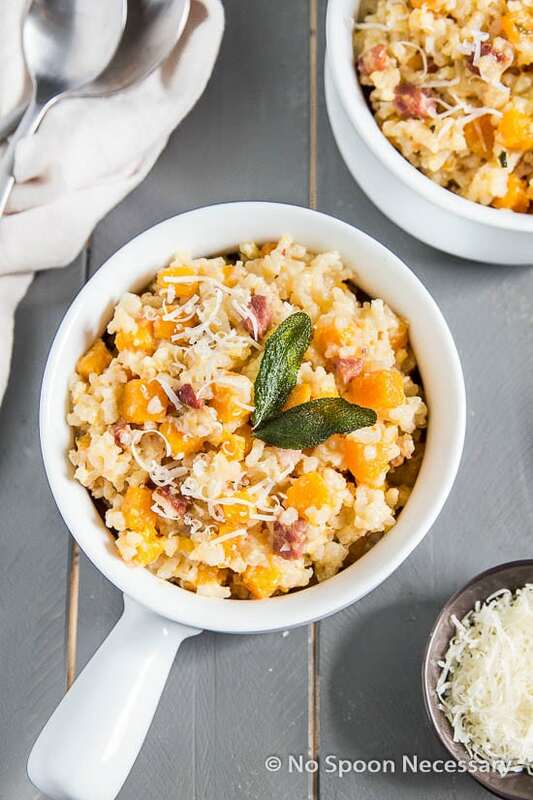 This Baked Butternut Squash Risotto requires ZERO stirring! 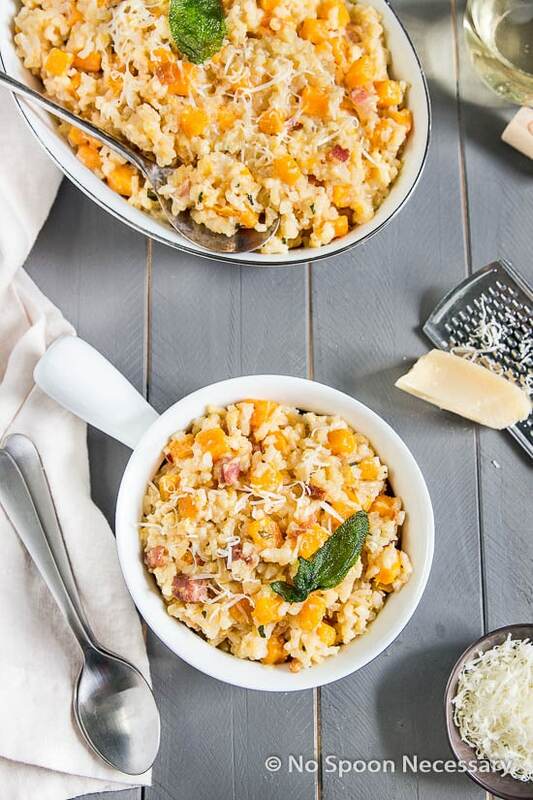 Loaded with tender butternut squash, meaty pancetta and crispy sage leaves, this risotto is easy AND delicious! Being a food blogger is a very strange job/hobby. There are no clearly defined rules. In most cases, it is just one person, their kitchen, camera and a computer; translating their creativity into words and photographs, and sharing it via the internet. Basically, it is a creative concept and process, materialized. It is our creative outlet. No one tells us what to write, what is appropriate to share, or how much of ourselves we should put out there. If you don’t blog, you probably don’t realize how vulnerable it leaves us… open to both criticism and praise. I’ve followed some blogs loyally for years, others sporadically, and some just for the past a few months. I am constantly discovering blogs, both new and old. I am not ashamed to admit that I compare myself to other blogs all the time, and I’m constantly feeling inadequate. How can I differentiate myself? 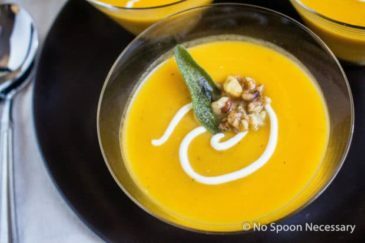 How can I stand out from a crowd of thousands of food bloggers? I’ve hit many lows where I have felt like quitting. But, I never do. The main reason I hold steadfast, is all of you reading this. Even if you never leave a comment, or we have never “met”, I have a deep seeded love and appreciation for you. For those of you who do leave comments, and you fellow bloggers who visit this site often, your support of NSN has brought so much joy into my life. But, regardless which of those categories you fall into, I just wanted to say, whole heartedly, thank you. Thank you for all the smiles you have put upon my face. Thank you for reminding me the struggle is worth the reward. Essentially, thank you for being you. I <3 you! 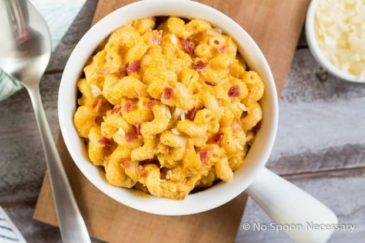 I promise all that sappy rambling I just forced upon you is worth it, because today’s recipe is a killer and easy. 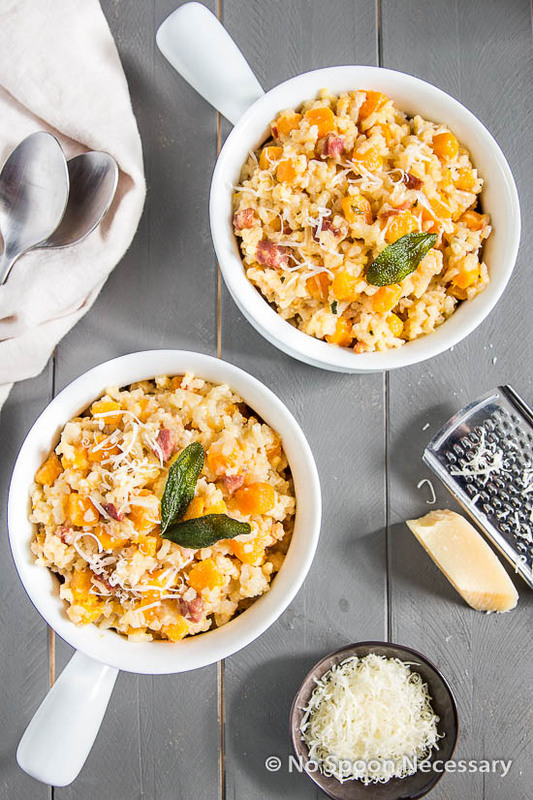 Risotto is one of my favorite dishes, and ever since I discovered the easy bake method (not to be confused with that oven of the 90’s for kids) years ago, I tend to prepare it pretty often come the fall season. I blogged about my discovery of baked risotto, but in case you missed it, I was extremely reserved at first. 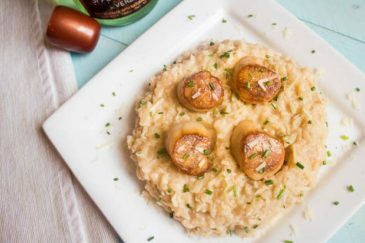 Coming from a culinary background, I didn’t think it was possible to create a creamy risotto without constantly stirring and slowly, steadily incorporating a warm stock. I was pleasantly surprised to find out it is not just possible, it is just as delicious as it’s needy, stove top counterpart. Needless to say, I haven’t stood over a stove to make risotto in years. And you shouldn’t either. 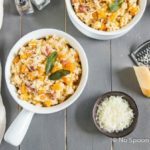 This butternut squash risotto is one of my favorites, and the flavors completely scream, “autumn”. 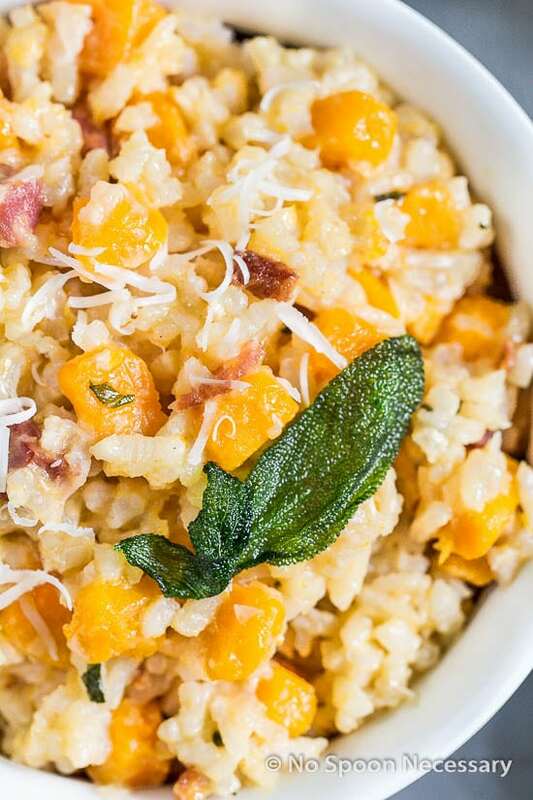 This risotto is a perfect marriage of sweet and savory. It is earthy, a tad salty, a touch cheesy, impeccably rich, and completely creamy-dreamy. The baked risotto melts in your mouth like buttah, and will make you have a “When Harry Met Sally” diner moment, so consumers beware. How long will risotto last in the fridge? 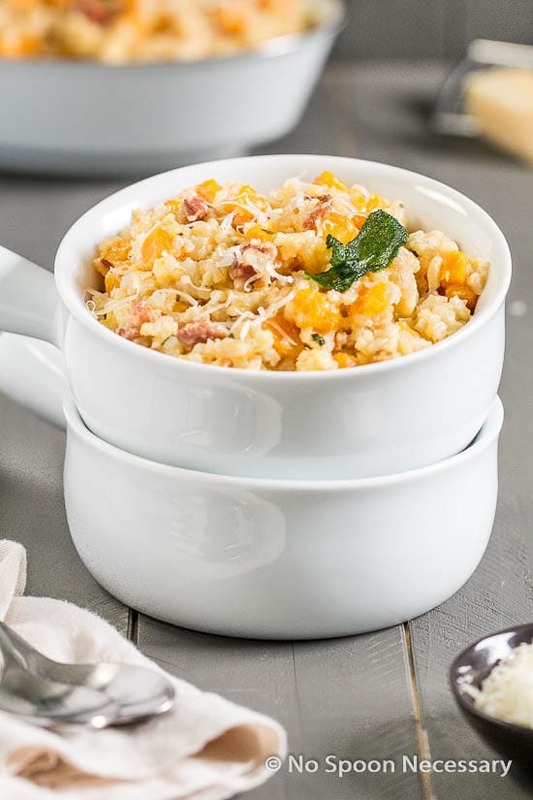 While risotto is definitely at its finest when it is served fresh, you can store leftover risotto in the refrigerator. Risotto can be kept in an airtight container in the refrigerator for up to 3 days. 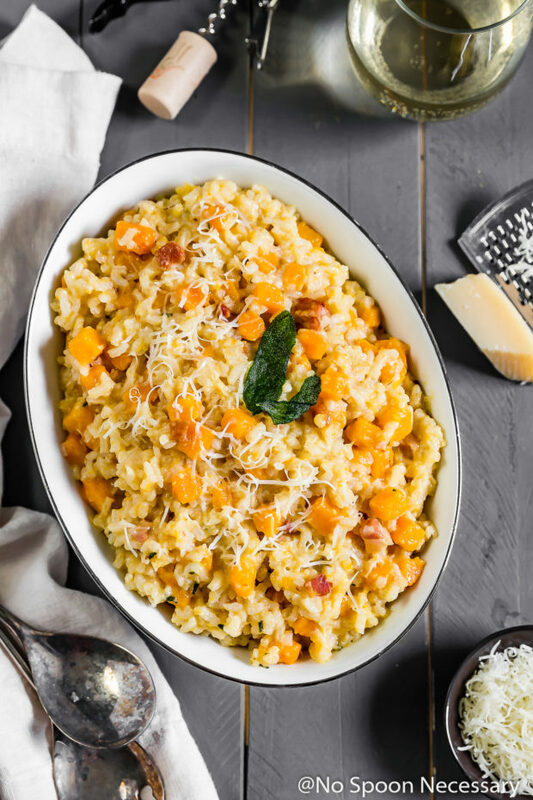 If you omit the pancetta from this baked butternut squash risotto and make it a vegetarian dish, you can store the leftovers in the fridge for up to 5 days. Fair warning, as I stated above, reheated risotto will not taste exactly the same as it did when it was served fresh! But, that doesn’t mean you can’t reheat it. To reheat leftover risotto, you will need 1/4 cup of broth for every 1 cup of cooked risotto. Bring the broth to a boil in a pot on the stove. Add in the risotto and stir for a few minutes, or until the risotto is warmed throughout. If the risotto is still too thick for your liking, add in more broth, one tablespoon at a time, until desired consistency is reached. If you don’t want to be bothered reheating risotto, using the cold risotto to make arancini is a fabulous idea!! Can you freeze baked risotto? Cooked risotto (or any rice for the matter) can become hard when frozen and the texture of the risotto will become grainy and unpleasant. For that reason, baked risotto should not be frozen. Until next time, Cheers friends – to easy elegance. Place a large skillet over medium heat and add pancetta, cook until crisp, about 3-4 minutes. Use a slotted spoon to transfer the pancetta to a medium bowl. Add squash to the pancetta drippings in the skillet. Season with ¼ teaspoon of salt and 1/8 teaspoon of pepper. Increase heat to medium-high, and cook, stirring occasionally, until tender, about 8 minutes*. Add the sage leaves and cook until fragrant, about 1 minute. Remove from heat and transfer the squash and sage to the bowl with the pancetta. Girl, you better keep goin’, cause I just found you! Always nice to meet kindred spirits even if in the blogosphere. And my, my, my do you have friends! That says somethin’ you know! 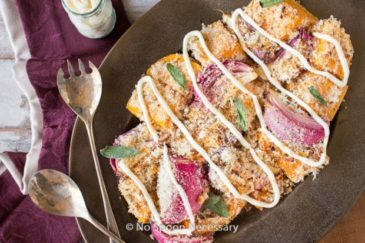 Girl, your recipes never disappoint, this creamy fall risotto is no exception and I just want a huge bowl and a big spoon to enjoy it! It is such a strange journey, isn’t it? You are doing such an incredible job though and that’s why we all keep coming back! It’s sometimes hard for us to see our blogs the way others do, the whole picture, the style, the story, the feel. I know I struggle with that myself. Who am I? Right? But reading NSN is always a bright spot in my day. You’re upbeat, positive, fun, and inspirational. And your recipes are bangin’! This is certainly no exception – gimme all the crispy sage leaves!